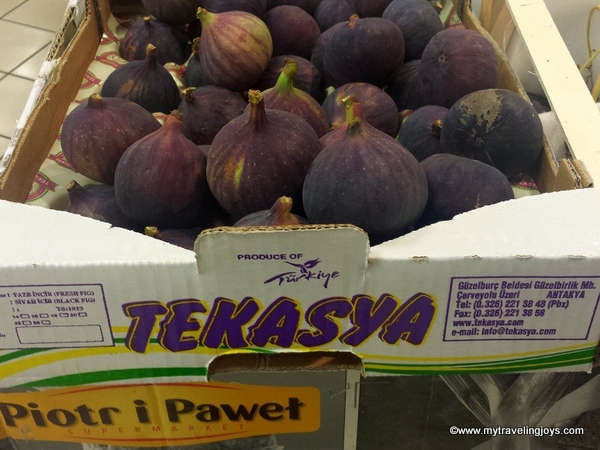 Imagine my surprise when I stumbled upon Turkish figs at a gourmet grocery store here in Warsaw. Yep, I found several boxes of sublime, purple figs from Antakya, Turkey, at my neighborhood Piotr & Pawel, which is kind of like a local Whole Foods store. 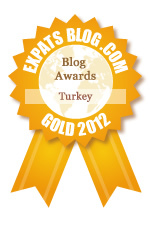 Antakya is a city in southern Turkey, near the Syrian border, and is located more than 3,000 km away from Warsaw! Ecstatic, I purchased several of these luscious, rare treats at 1 PLN each (60 Turkish kuruş or .30 U.S. cents). In Istanbul at the pazar, I normally could buy a whole kilo of these for just 5 TL! Still, the price here in Warsaw is much better than what I would pay on the East Coast back home. August and September always seemed like peak fig season in Turkey. The pazar stalls would be filled with perfectly stacked figs. This year, I’m missing out since we moved to Poland. However, to keep looking on the bright side, I have enjoyed the bountiful berry season in my new home. I try to keep my complaints at a minimum. Once home, I was unsure what to do with my precious fig cargo. Dessert or salad? I started thumbing through my Turkish cookbooks. In Aegean Flavours, Istanbul chef Didem Şenol, owner of Lokanta Maya restaurant, roasts Turkish figs with honey, crushed almonds and rosemary. I took that idea and simply tossed my figs with Polish honey and roasted them in the oven until they were softened. For an afternoon tea-time snack, I took a few of these still warm figs and topped them with dollops of whipped vanilla cream and crushed Turkish pistachios. Last night, I took the remaining roasted figs, added them to an arugula-tomato salad and drizzled them with Turkish nar ekşisi. Italian balsamic vinegar would work well here too. Unfortunately, the leftover figs did oxidize so they didn’t look the best, but still tasted wonderful. Sometimes simplicity really is best in cooking. A delicious afternoon snack with a glass of Turkish tea at home. Simply, place the halved figs in a bowl. Drizzle a few tablespoons of honey over the figs and add a pinch of sea salt. Place in a glass baking dish or on a tray covered with baking paper. Bake at 350F/176C for 10-15 minutes until figs are softened. Let cool slightly before using in a salad or serving for dessert. For dessert, whip a bit of heavy cream with a pinch of vanilla or plain granulated sugar in a bowl. Place dollops of sweetened cream on top of the figs. Garnish with crushed pistachios or nuts of your choice. they look wonderful! i have 1 fig on my turkish fig tree. i don't know what happened because usually it is loaded with them. nothing tastes as good as a sun warmed freshly picked fig. are you not liking warsaw much? I've been experimenting with figs baked in honey and balsamic vinegar - they are great with a piece of white cheese. @Joyce, I agree about the figs! No, I really do like Warsaw, just at times I really miss Istanbul, in particular my friends. @Annie, that sounds delightful! I miss Turkkish beyaz peynir! THis sounds so delicious. I'll have to try it. I also liked the idea of adding some white cheese to the dish.